A gospel singer left majority of Kenyans sinking in their seats and shaking their heads with remorse after openly confessing some of the demonic things he used to do as a kid. Nelson Namanda, an upcoming gospel singer, scared Chipukeezy out of his wits after confessing that he cut his toe and licked a snake with his blood to join a satanic cult. He was speaking on Ebru TV. According to the young lad, he was recruited to the cult by an old woman she met at the river unknowingly after greeting her. ‘‘Cultism is real, its just that people are trying to ignore it. I am a normal person like you but I was initiated into a cult(known as Chinyinga) when I was in Class Six. The cult had like 110 members,” he revealed. More powers The singer said that cult wanted him to sacrifices a part of his body so as to get even more demonic powers while in Class Eight, a reason why he cut his toe nail. “When I got to Class Eight, they told me they wanted to give me a higher rank. So they told me to give them any part of my body to prove to them I was serious with the cult. So after much thought I decided to sacrifice my toe because I knew no one will know about my missing toe. I became a beast after the sacrifice. My spirit could even go to Busia and do all manner of atrocities while I am in Nairobi,” he added. 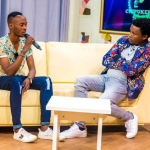 The post Gospel singer shocks Chipukeezy after revealing how he sacrificed his toe and licked a snake to join satanic cult appeared first on Ghafla! Kenya.